Bus from Melaka to KL is one of the popular bus services in Melaka Sentral. The demand for the bus service is very high from the locals as well as from the tourists. As a UNESCO world heritage site, Malacca is a must-visit attraction for tourists coming to Malaysia. After spending their holiday in Malacca, taking a bus from Melaka to KL is the most convenient and most economical transportation option. Hence, tourists rely on the bus service between Malacca and Kuala Lumpur to connect the two largest tourist hotspots in Malaysia. KKKL Express and Transnasional are the two famous brands serving bus from Melaka to KL. Locals prefer the two brands because of their punctuality and frequent schedules. Another relatively less famous but quality bus is Delima Express. From morning as early as 6.30am until 8.30pm in the evening, almost every 30 minutes, there is a bus leaving Melaka Sentral for Kuala Lumpur TBS (Terminal Bersepadu Selatan). The fare for a bus from Melaka to KL is around RM 10.00 – RM 13.60 per ticket. The travel duration for the bus from Melaka to KL is about 2 hours depending on traffic conditions. The coach will travel directly from terminal to terminal without stopping, unless there is a special request from passengers for washroom breaks. The departure point in Melaka for all buses is at Melaka Sentral Bus Terminal. The arrival point in Kuala Lumpur is at TBS (Terminal Bersepadu Selatan). TBS is a southbound bus terminal in Kuala Lumpur and Pudu Sentral is a northbound bus terminal in Kuala Lumpur. For tourists who wish to go to other cities in the north of Peninsular Malaysia, they need to take LRT service from Bandar Tasik Selatan station to Plaza Rakyat station. Pudu Sentral is just beside Plaza Rakyat LRT station. Here is the guide. 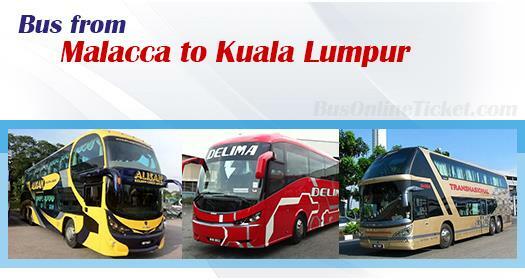 If you would like to travel with famous coach operators like KKKL and Transnasional, it is always better to book Melaka to KL bus ticket online in advance at BusOnlineTicket.com to avoid disappointment, especially during weekends. Booking Melaka to KL bus ticket online is also the most convenient way to get your bus ticket to avoid long queues at the terminal. Instant confirmation online booking gives you peace of mind that you have your transport in place before you travel.